It's easy to excite crowds at the University of Tennessee's Thompson-Boling Arena, which serves as home court for the basketball coach Pat Summitt, and her Lady Volunteers. The 24,000-seat arena's operators understand that precise audio is crucial to keeping fans at a fever pitch, and depends on Symetrix SymNet digital signal processing to keep everybody moving. Mark Lowrance, president of AV design firm, Lowrance Sound Company of Union City, TN, commented, "SymNet allows me to be completely confident in the audio processing system that we designed for such a well-attended facility. After one entire season of SymNet, we've had zero problems." 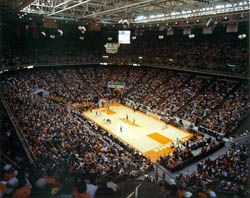 With great athletic action pretty much guaranteed at every contest at UT's Thompson-Boling Arena, Symetrix SymNet ensures that the sound will always add to the intense atmosphere. Originally built in the early 1980s, the arena was forced to replace the failing system front end as both the UT men's and women's basketball teams reached national prominence. With a need for a full 196 output channels, 12 inputs, and massive processing power, Lowrance knew from experience that the control, flexibility, and sound quality of the SymNet DSP solution was ideal. In all, 18 1RU SymNet Express Cobra units were specified, allowing Lowrance and his team to replace five racks full of equipment with a more efficient 2-rack system front end. Working on Ethernet and CobraNet networks in conjunction with existing Electro-Voice speakers, Crown amps, and a Crest 8 x 32 console, SymNet's processing, based on four SHARC floating-point DSP chips, 24-bit A/D and D/A converters and a dynamic range of 110 dB, delivers the clear sound quality that Thompson-Boling Arena's environment demands. Symetrix's commitment to complete support was also a key factor in Lowrance's specification of SymNet. "This was a big project with a short timeframe and a great deal of challenges," he noted. Lowrance said, "SymNet did exactly what I needed, giving me distributed processing, audio fidelity, and networking with solid reliability at the core."